If you are looking for a perfect golfing holiday, Finland must be the right place for you. Summer in Finland is the best time to play golf – literally, you can play golf the complete day. That’s because every summer Northern Finland becomes the land of the “Midnight Sun” – with non-stop sunshine for 24 hrs a day. The Green Zone or Tornio Golf Club located in Tornio, near the artic circle and on the Swedish border, is a unique golf course in what is already an unusual environment. The club has 9 holes in Finland and the remaining 9 in Sweden (out of which 4 crosses the International border). The golf course not just combines two countries but also two different time zones with a difference of one hour. This technically means your ball remains on air for 1 hour before it actually lands on the green! The Green Zone is one of around 100 Golf Courses in the country. And these courses are unlike those outside Scandinavia, they reflect Finland’s nickname as the “land of 1000 lakes” (actually there are around 180,000 lakes – Finland is being modest here). And with only 800 registered golfers per course (80,000 golfers out of a population of 5 MM), and summer golf 24 hours a day, it becomes pretty easy to get a tee time! The Green Zone Golf course also hosts the Midnight Sun Golf 90 Holes Marathon tournament which is played non-stop for four days and three nights and is indeed a real test of stamina for the golfers. If you want to play in this amazing course, all you need is a handicap card. If you don’t have one yet, sign up with MyScorecard (Intercontinental flight not included). 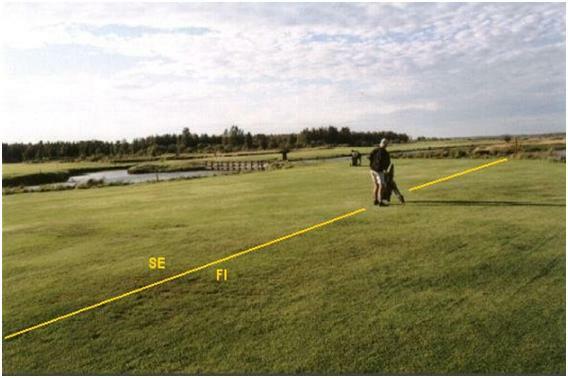 This entry was posted in Golf Around the World and tagged finland, green zone golf by Cat Metzner. Bookmark the permalink.